Attention has turned from the horn guides for leading and trailing wheels to the substantial horn blocks for the centre driving wheels. 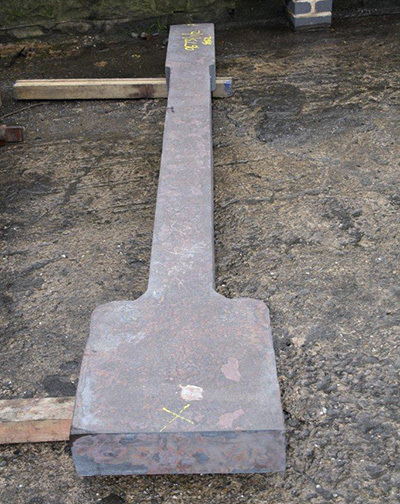 The bushes for the cross stays have been pressed in and the fitting of the manganese liner plates is in progress. The stretchers to the front and to the rear of the smokebox saddle have had the holes reamed through the main frame plates and cold rivet manufacture is in full swing in anticipation of getting these stretchers riveted in. 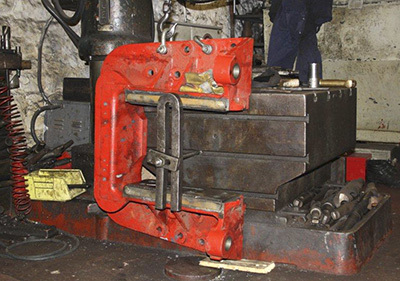 The forged connecting rod blanks in EN16 steel have been manufactured by Somers Forge Ltd. Machining will probably take place at a later date as funds permit. A member has kindly offered to sponsor the casting of the spring brackets for which we are very grateful. The combined value of the above is over £13,000 - many thanks to all concerned! In addition, we are anticipating sponsorship of the two anti vacuum valves (one for each cylinder - that prevent exhaust gases being drawn back into the cylinders when coasting) within the next few days. We will shortly be publishing details of the brake shaft bearing bushes and also of castings for components for the rear pony truck assembly, as we plan to order these items in conjunction with another (non-SVR) group whose engine has the same rear pony assembly as the Riddles Class 3 tank. This makes good financial sense, as both groups may benefit from - hopefully - economies of scale and therefore a lower cost for these items. One of the forged connecting rod blanks. One of the horn blocks on the radial arm drilling machine. Spring bracket castings £712-00 sponsored!